Visit BucketList.org and type in your state. If you live near state borders, search for the surrounding states or even nearby major cities. See what other people want to do in your state. You can probably guess the big, obvious ones, but drill down to mine the ideas of others – you may be surprised. Go ahead, search for a state. If you can’t find it, build a staycation bucket list and put your state on the map. Great example: hike the highest peak in your state. For some states, or some people, it will be a scavenger hunt just to find out where that is and how to hike it. Google your state’s tourism commission and request the free brochures. If you’ve lived somewhere your whole life, or even just a few years, you may not see your home state with fresh eyes. Visit a tourist attraction you’ve never been to. Take that scenic highway the whole distance, or grab a friend and do the historic walking tour. 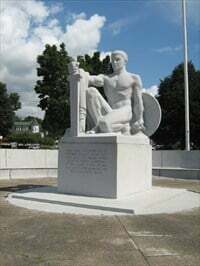 In Barre, Vermont (pronounced Barry), we know this as the “naked guy statue.” Only a staycation taught me the WWI history of the sculpture and the interesting acoustic capabilities of the curved granite wall behind it. Select a town or city more than an hour away. This can be a big city or a little village, it doesn’t matter. Do some research on what there is to do in the area and take a one-day field trip to explore. You may find it only takes a morning to visit the coffee shop and antique stores, or you may find hidden adventures in a nearby state park. Even if you’re heading to a big city, planning how to use just one day will provide you with a fresh perspective. Great example: Going to an “oxygen bar” was on my bucket list and I found one nearby when planning a field trip – to a very working class town, I might add. Who knew? Lots of bucket list goals can be done in your own home, including: learning how to crack an egg with one hand, making a list of 101 things that make you happy, reading the Bible, and learning how to meditate. Don’t let a budget limit your whole bucket list. Get started on the things you can do close to home with minimal time or cash.